Hi Folks! As we impatiently wait for the 2018 riding season to finally get under way, we at NRSA thought we would like to take a break from cursing Mother Nature and let the membership know what has been going on behind the scenes in preparation for the season that seems to having a hard time kicking it into high gear! Believe it or not, preparations for this season began shortly after the 2017 riding season ended. 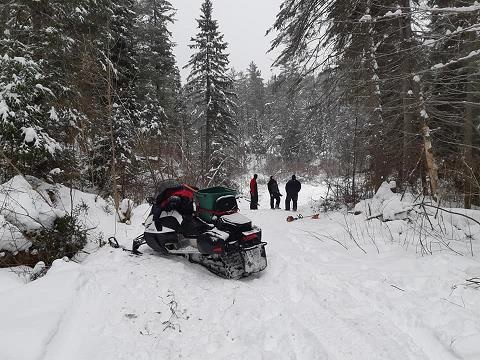 No rest for the dedicated volunteers at North Renfrew Snowmobile Association, as they seem to live and breathe snowmobiling for 12 months of the year! Their mantra is "If you can't ride, you might as well be planning to ride!" 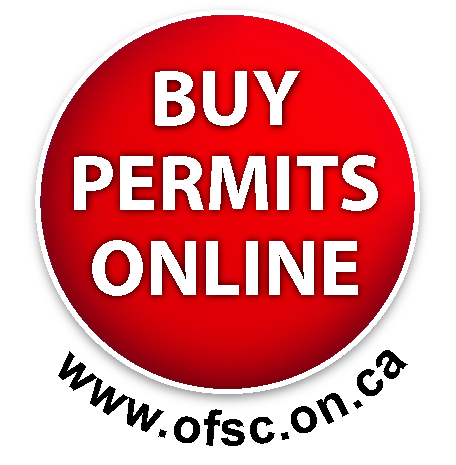 The buzzword of the year across the District is MOTS, otherwise know as the "More on the Snow", the OFSC initiative to streamline the financial structure as well as implement a life cycle management program for the groomer fleet. Throughout the summer, several information sessions and meetings were attended by members of your executive to maintain a firm grasp of the pending changes with regards to how the NRSA will conduct business in the future seasons. Collecting information compiling inventory lists and preparing for amalgamation with the District occupied as a substantial amount of volunteer hours during the summer but will undoubtedly pay dividends as clubs across the District prepare to operate in a completely different manor. 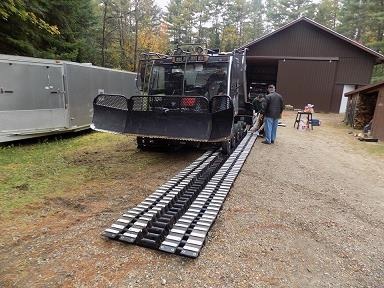 Groomer maintenance is another activity that NRSA volunteers spend their time doing during the off-season. 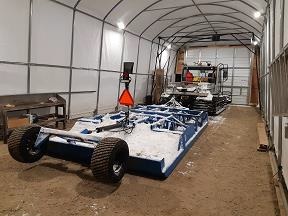 This year saw several upgrades as well as a full complement of preventive maintenance take place under the coordination of Clair Cox and Phillipe Ducharme, the NRSA Groomer Coordinator and Maintenance Rep. respectively. "Welder Extraordinaire", Andrew Ahokas skillfully reinforced the leading edges of our drag with new stronger steel so that the groomer operators can safely continue to bounce it off the rocks and stumps that hide just under the surface of the snow and suddenly jump out to bang up the drag...No idea how that happens! John Montin, our treasure and resident wiring expert, installed some fantastic super bridge LED lights at both the front and back to light up the night! 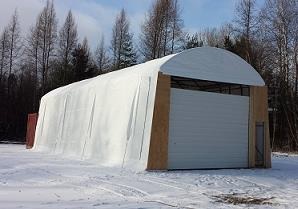 Snowmobilers will certainly see it coming now! The NRSA groomer operators complained last year that they had difficulty finding passengers to accompany them on some of those long 7 to 10 hour night trips. I alluded to the fact that it was probably a hygiene problem on their part, but they assured me that it was because of the uncomfortable passenger seat. One of our Directors, Doug Pinard who in 2017, had more hours in the groomer as a passenger than he did on his sled, confirmed this to be true! 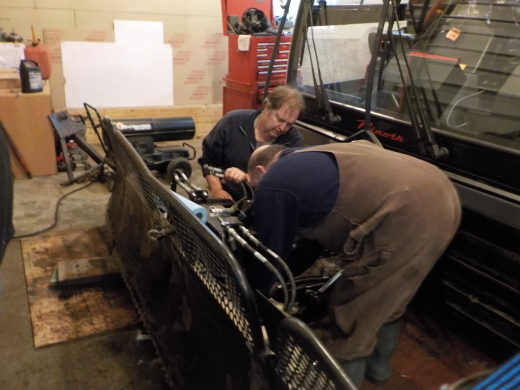 With that in mind, volunteers fabricated a mount and installed a new and improved seat out of a BR-160. No more lonely trips! As summer drew to a close, it was time to attend the OFSC AGM 2017 held in Markham this year. 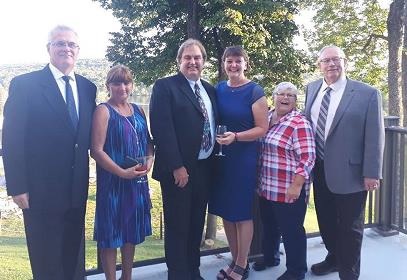 Attending from NRSA this year was Paul Kelly (President), Simon Lawson (Vice President), Karen Crain (Secretary) and Doug Pinard (Director). Of course MOTS was the main topic of discussion, but there were also lots of opportunities to socialize and gather information on best practices with other clubs from across the Province. 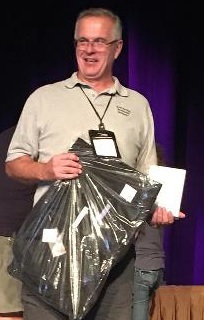 The highlight of the conference was of course the President’s dinner and Awards Ceremony. NRSA was extremely proud to see our very own “Karen and Dougie” recognized as the OFSC Provincial Volunteer Family of the Year!!! 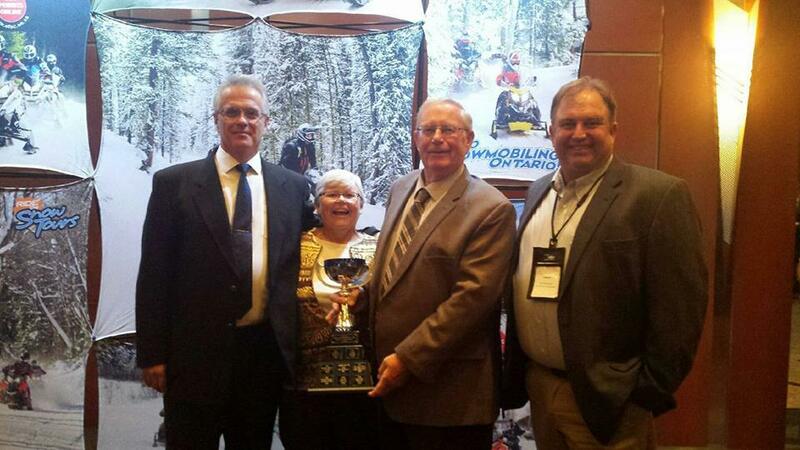 This was a huge deal at a gala event and finally recognizes the countless volunteer hours that this dynamic duo put into NRSA operations and towards organized snowmobiling as a whole! 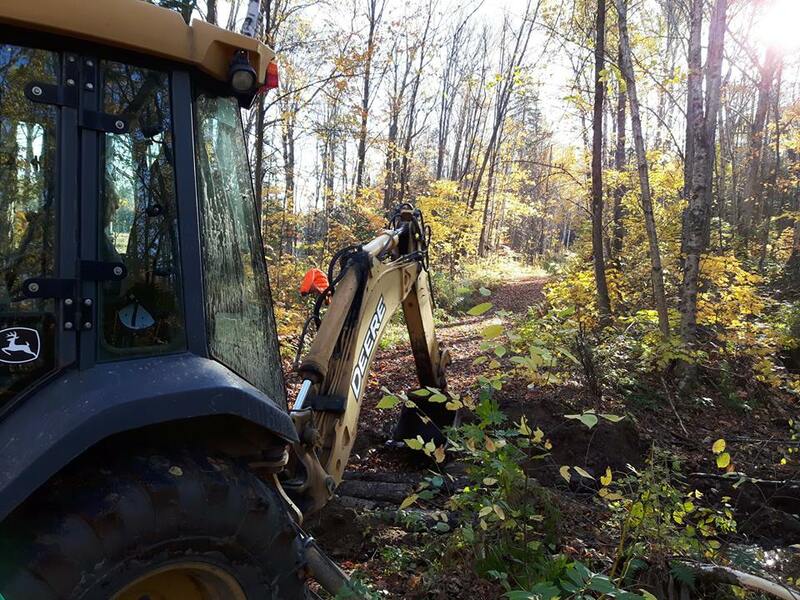 The end of September at NRSA is traditionally a busy time, as our Trail Coordinator begins to ramp up the trail improvement projects decided upon by the Trail Improvement Committee. 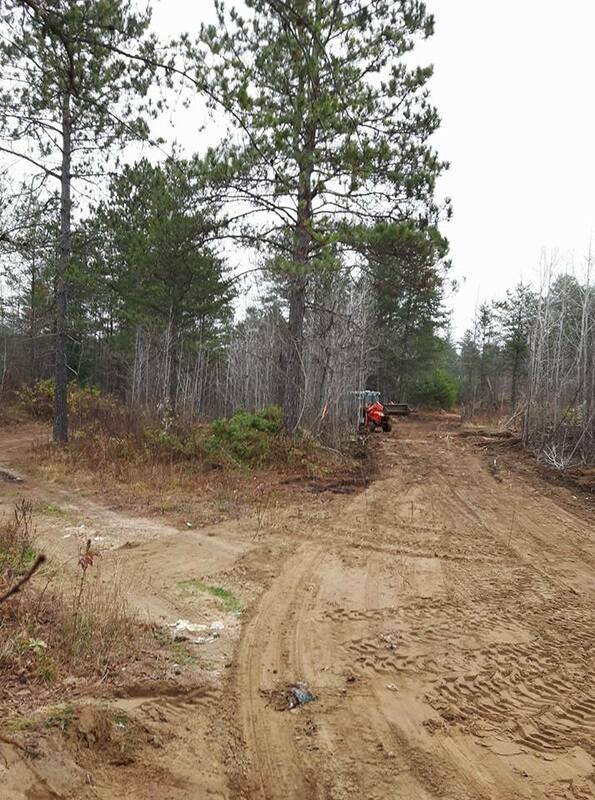 This year was no different and there was an ambitious list of improvements planned for completion to aid in providing the best trails possible. Our Trail Coordinator, Simon Lawson must have seen this coming as he opted to check in for a tow week paid vacation at the Heart Institute followed by 6-9 weeks of recuperation! No worries, in true NRSA family fashion, Clair Cox and Bruce Boucher stepped up and completed all of the planned upgrades as well as some extras. Thanks Guys!! Through the use of a rented backhoe the two worked tirelessly un-blocking culverts, removing rocks and repairing trails that were washed out due to beaver activity....Did I mention that 2017 was the year of the beaver!! 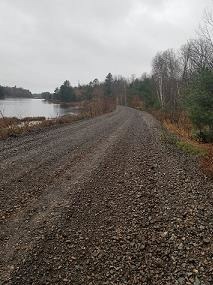 Section of the A trails as well as the 138 were completely washout as a result of weak beaver dams coupled with the unusual amount of rain received. These repairs were an unexpected expense but critical to complete to preserve the integrity of the NRSA trail network. In the east end improvements spearheaded by Marvin Dupuis and Paul Kelly took place on the 133 as well as the A trail. Some re-alignment and straightening of the trail will make for safer sledding and easier grooming when the snow arrives. 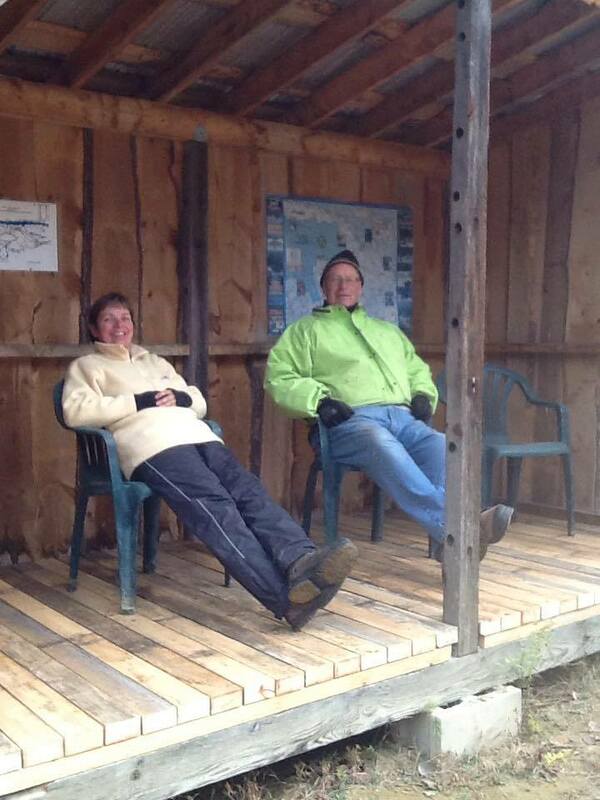 Our beloved "Stopping Place", on the A trail just west of Deep River has seen some improvements this year as well. Thanks to Lise Hunter for the generous donation of lumber to complete the floor! Now Dougie Dog's can operator in a more sanitary enviroment rather than a dirt floor on some sunny afternoons this February. Lise and Doug sat on the new floor!